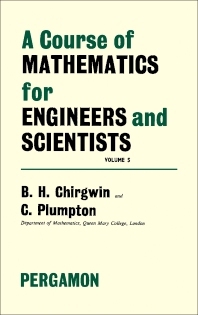 A Course of Mathematics for Engineers and Scientists, Volume 5 presents the solutions of differential equations by obtaining the results in different forms. This book discusses the significant branch of mathematics generalizing the elementary ideas of function, integration, and differentiation. Organized into four chapters, this volume begins with an overview of the use of Fourier series that leads to solutions consisting of infinite series. This text then discusses the fundamental advantage of Laplace and Fourier transformation. Other chapters consider the technique of obtaining the solutions of ordinary, and several partial, differential equations from definite integrals. This book discusses as well the mathematical basis underlying the transformation methods connecting Laplace and Fourier transformations, which is given by the advancement of complex variable theory. The final chapter deals with the series of devices for inverting the transformation functions. This book is a valuable resource for scientists, engineers, mathematicians, and undergraduate students.